My plan was not to blog about my contribution to our neighborhood cookout just yet. But time got away from me for any other post. You were going to get it anyways, now it is just early. Since the cookout is usually really really warm, we don't bring hot food. We want to make it easy, but not store-bought. I went with a corn dish. Well, more than corn, but that seemed to be the bigger ingredient and it is the only cooked part of the recipe. 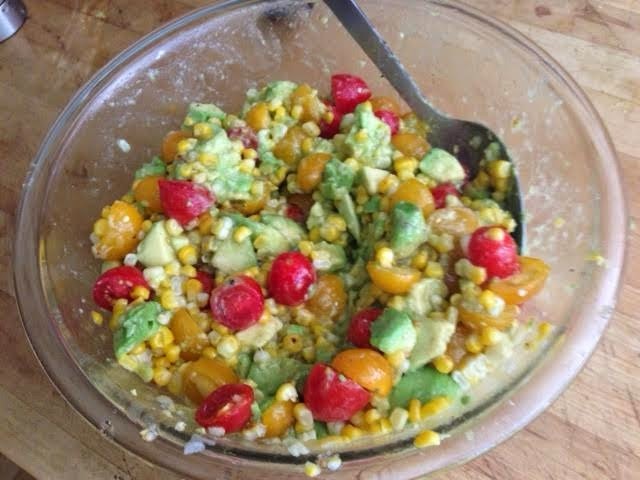 It is actually Corn Avocado Tomato Salad with Honey Lime Dressing. As we were providing for dozens, I doubled the recipe, but here is the actual single version. I made the vinaigrette first. 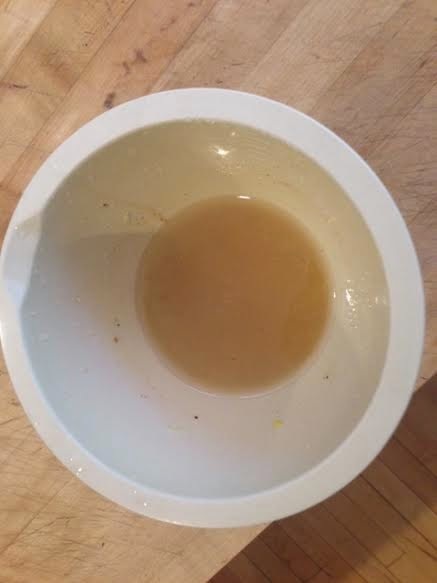 Easy enough: combine oil, juice of one lime, oil, minced garlic, honey, salt and black and cayenne pepper. Set to the side. 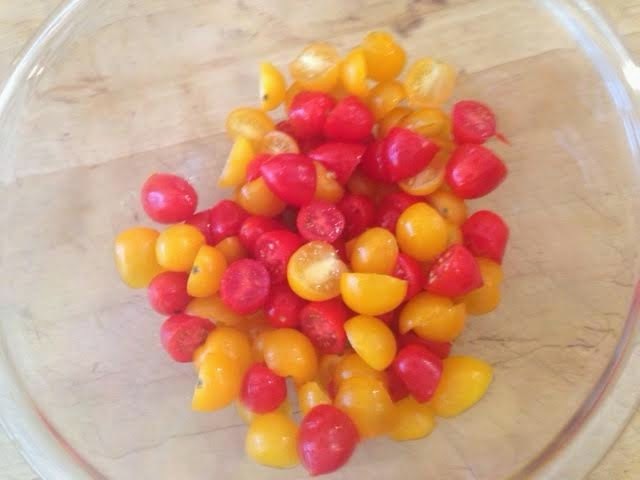 Halve a pint of cherry or grape tomatoes. I used to different colours - because I needed two pints since we doubled the recipe. But also because I am that gay. 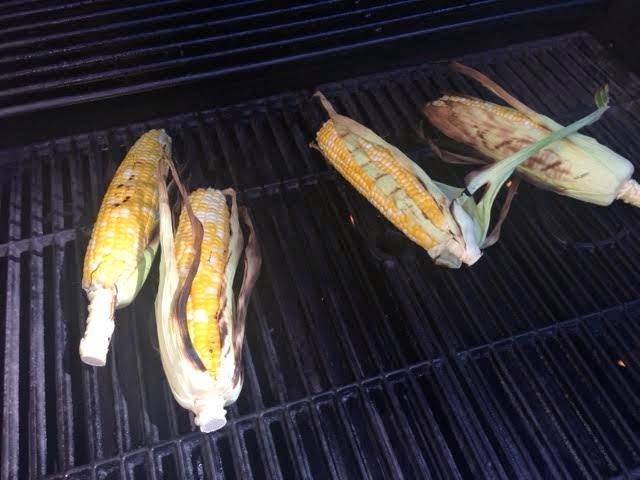 Grill the corn for 10 minutes, turning continually, so it cooks on all side. I tried keeping some of the husks on, but I'm not sure it made a difference. 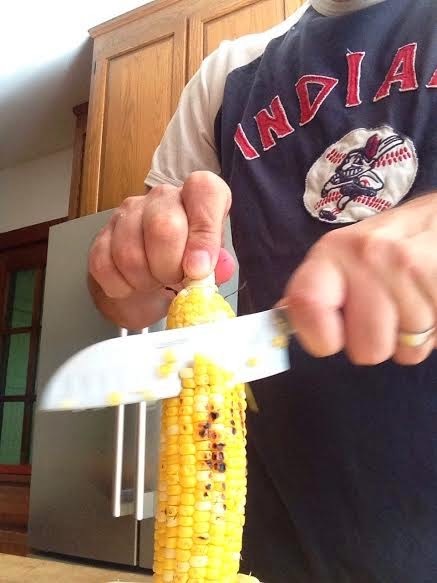 Cut the cooled corn (though hot is fine) off the cob. It's amazingly easy to do, if you've never tried. And yes, I'm wearing a Chief Wahoo shirt. First, it's the only thing Red, White and Blue I own. Secondly, we took the land from the Indians. Thirdly, they used corn, but they like to call it 'maize'. 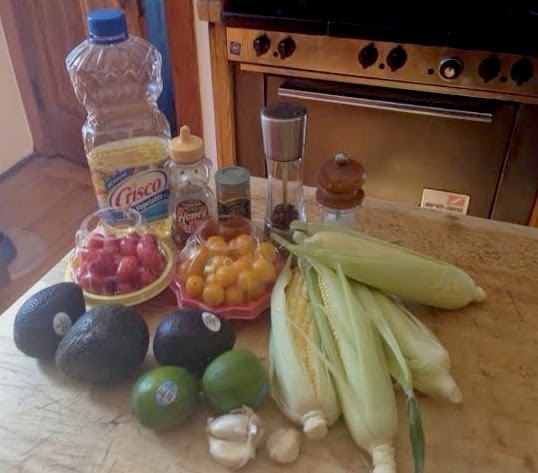 Add corn to the bowl with the tomatoes. At this point I also poured in the vinaigrette. I wanted it in there before slicing the avocado. I put the avocado in last, and gently tossed it all together. The lime juice will keep the avocado from turning brown. Let it all marinate for at least 10 minutes and serve. I wish I could say it looked better, but not by much. It all tasted very good, though both 710 and I agreed that it was missing something, though we couldn't quite put our finger on 'it' was. The corn was sweet, but the honey helped. The lime and garlic worked too, but I didn't really taste cayenne. I will say this: there was another corn dish at the cookout and placed right next to ours. Ours was gone in 15 minutes. The other was still there upon our departure an hour after that. I won't disparage whomever brought the other dish - as I had to try it compare. I liked it, though they were clearly only had corn as the main ingredient. It's an easy dish and great for summer. "I used to different colours - because I needed two pints since we doubled the recipe. But also because I am that gay." Only a neanderthal would use one color tomato! PS It looks, and sounds, delicious! It looks lovely, and just the sort of dish I enjoy - bravo! And of course you'd use 2 colors of tomatoes!! !